... from my absence from blogging - man alive life gets in the way always! I did do a mini wardrobe weed I'll have you know. WHAT CHAOS that was! 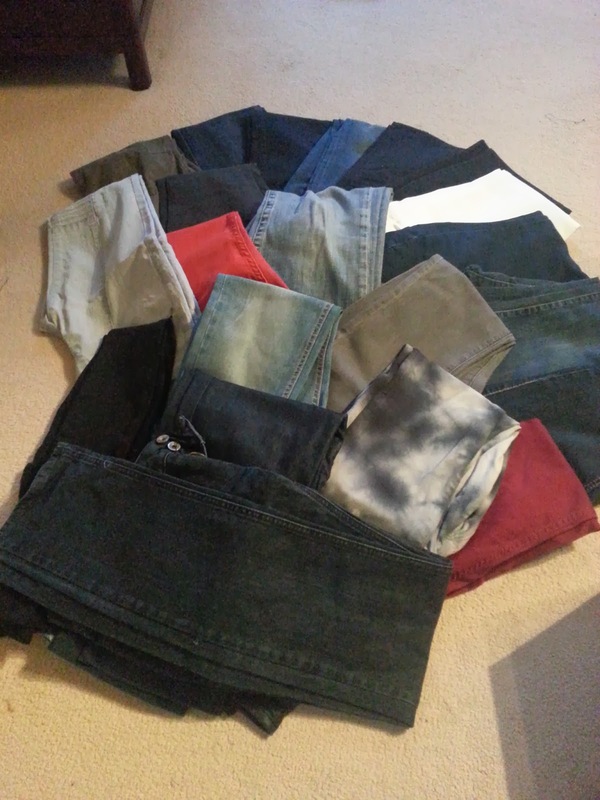 I got out ALL of my jeans from all the places they were hiding and in total I discovered 43 pairs - GASP! Of those 43 I wear (genuinely wear and will not part with) 33 of them. 10 have gone to a charity shop. They were either too short, too big or faded and old (why is it that every pair of black jeans I have ever bought look crap and faded within a few wears??). 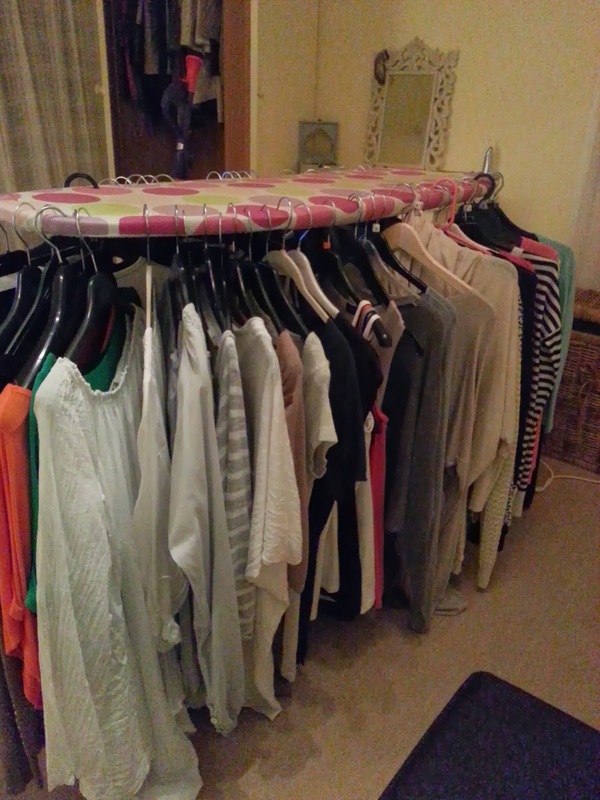 How I sorted my wardrobe - genius idea to sort around the ironing board into 'tops/cardigans/jumpers/vest tops. I didn't realise I had some many vest tops (over 20! ), cardigans (over 10) and jumpers (over 10) - YIKES! From having done this I set up a little second hand store to shift the cheap cheap stuff. And so to today, what am I wearing? 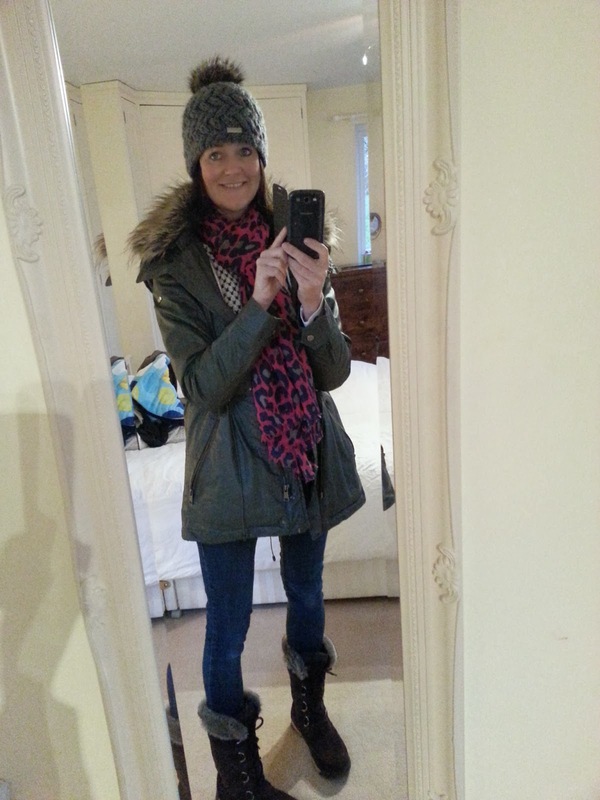 A bobble hat, parka, scarf from School Gate Style and fugly boots from Lands End - needs must, it's FOUL out there. Hope you're not too badly hit with the storms and flooding. LOL thighchaft - indeed it would have been! I was going to do a post on what I was giving away ie the jeans but really .. what's the point?! It's cold too - I HATE dressing when it's cold. ooh nice about looking 24 - thank you!!!! LOL keeping 10 and throwing away 33 - come on!! Go and count yours - ALL OF YOURS (including patterned/wax coated/skinny/boyfriend/all coloured) - I bet you have more than 10 - BET YOU! I honestly cannot part with 33 pairs - does that make me weird? 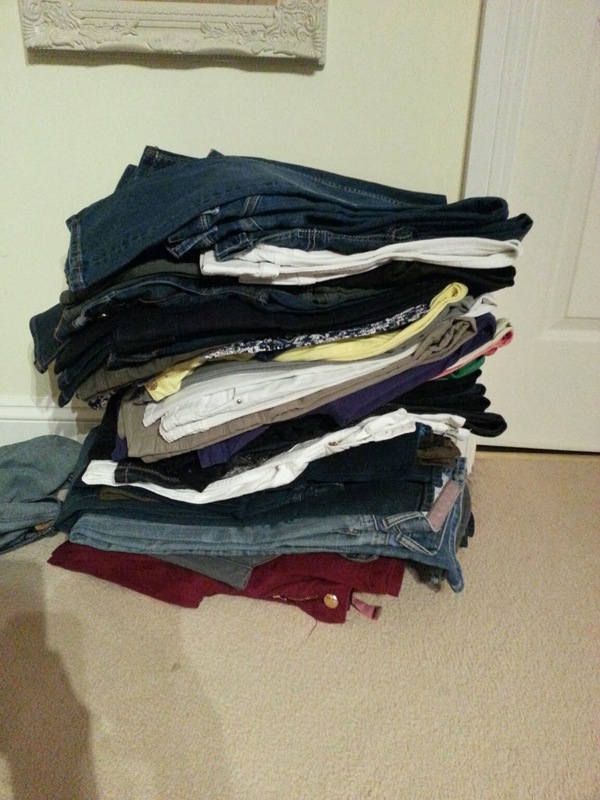 I thought everybody had this many pairs of jeans (cough cough)!!!! Fiona, that must be some sort of record. 43!!! 43??? I can't believe you will regularly wear 33 of them!! Good on you though. It's great having a good wardrobe weed. 43 doesn't look that much stacked up like this?!!!! YAY you have lots too - super happy to hear I'm not that weird for having so many! Do you have a style that you don't have?!!!! You make me feel so much better about my wardrobe! 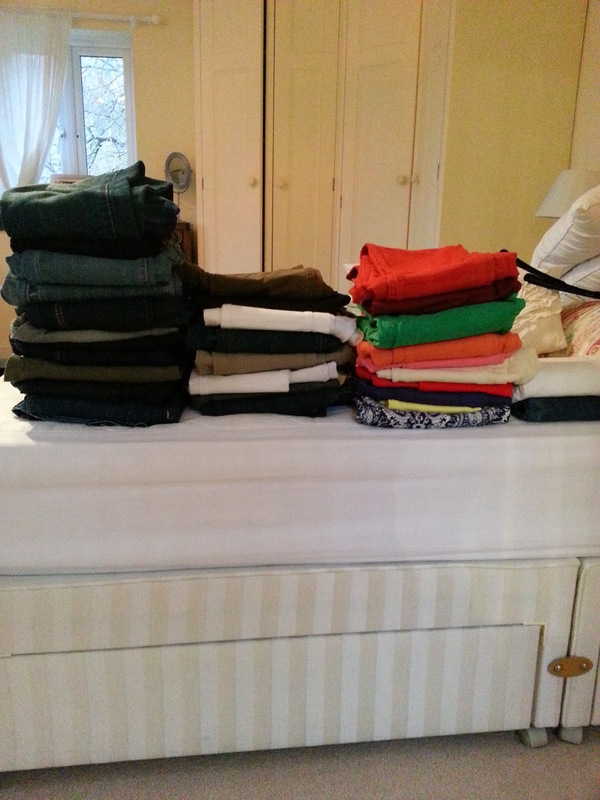 Remind me to show my hubs when he thinks I have too many clothes. But seriously, there are 33 pairs there that you wear regularly? I have more like 5 pairs that I wear in rotation and depending on the weather and my mood that day. But I could still do with culling a few more. And you look cosy and cool in your day outfit - the weather - tis miserable out there! You see, I am adding a service for all by being the one you can point your husbands too when they complain of your clothes!! trying to summon the energy to do the same, but can't be arsed, if it is still p***ing down next week (which by the way it is forecast to be) meet me for a coffee at Bicester Village? I tend to not work Thurs or Fri if you are around? yes, we'll celebrate surviving half term and not being under water, although levels rising fast around here. I should be pleased my husband doesn't complain too much then - ssssh don't tell him - I have said that all girls have this many pairs!